In America, “spring roll” is pretty much a catchall term for cylindrical Asian-American foods, like how we call everything between two slices of bread a sandwich. But a Reuben is no more like a patty melt than an egg roll is like a lumpia. All rolls share a common ancestry in Chinese cuisine, which has a heavy influence in Southeast Asia. Different regional ingredients and preparation styles created many varieties in different countries that share little similarity besides their meat-and-veggies-inside-a-wrapper commonality. Here’s how to tell the difference, so you can stop wondering why those plantain-filled rolls at your Filipino spot continue to not look anything like an egg roll. You may be thinking, "Wait, I thought this was a beyond egg rolls piece?" Well, it is. But also, you don't know much about what's beneath that sweet & sour-smothered layer of fried dough. Your typical Chinese-American takeout egg roll is mostly cabbage, flecked with bits of roast pork and carrots. 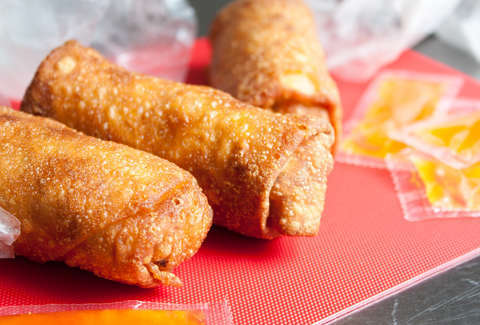 Egg rolls are still technically spring rolls (perhaps the first spring roll you ever tasted), but the wrapper dough is made with wheat and eggs, producing a thicker, fatter roll. A more traditional (and tastier) version would also have bamboo shoots, minced shrimp, and water chestnuts. 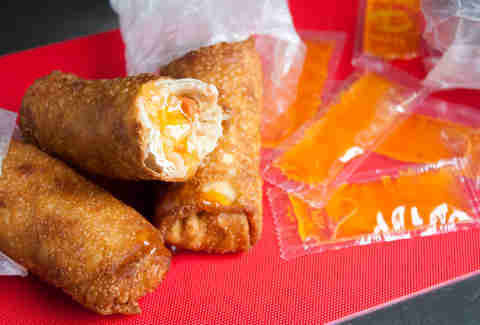 Egg rolls are usually served with sweet & sour sauce (or duck sauce) and hot mustard. 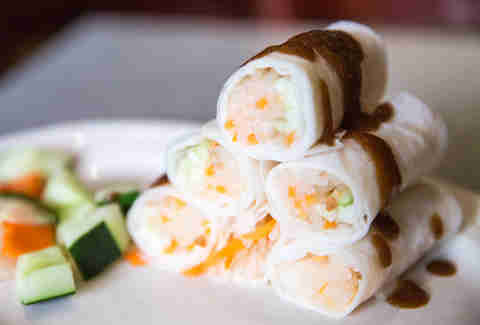 The Vietnamese make a fried spring roll called chả giò that combines ground pork with bean thread noodles, wood ear mushrooms, taro, and carrots. The rice paper wrapper gives these rolls a chewier bite, meant to offset the crispness of the fresh lettuce and herbs they're served with. Chả giò are only a few inches long and served with an addictive nước chấm dipping sauce made of fish sauce, lime juice, garlic, sugar, and chile peppers. 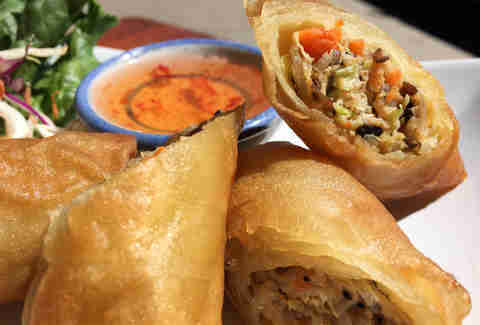 Thai spring rolls' filling is similar to Vietnamese chả giò, but the wrapper is thin and pastry-like. These are light, flaky, and served with sweet chili sauce. The Philippines' spring roll also uses a pastry-like wrapper, filled with ground pork or beef, water chestnuts, onions, and carrots. But it's much denser than other spring rolls because of the addition of an egg binder and the tightness with which they're wrapped. 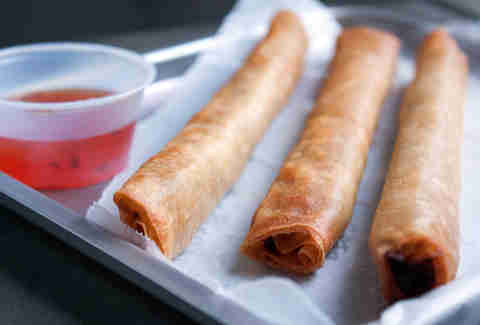 Lumpiang Shanghai are also long and skinny, like cigars, but sometimes cut up into bite-size pieces. Filipinos dip theirs in banana ketchup or sweet chili sauce. 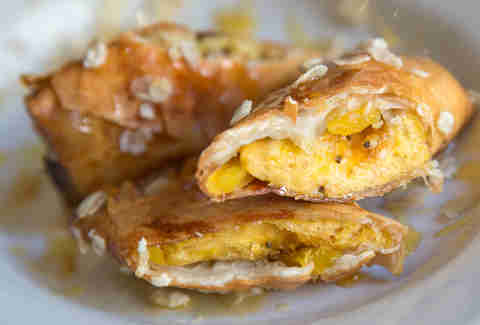 A Filipino dessert, the turón features bananas or plantains and jackfruit rolled in a fried spring roll pastry. They're either dusted in brown sugar or drizzled with honey. Vietnamese gỏi cuốn is one of the most common menu items at Asian-American restaurants. 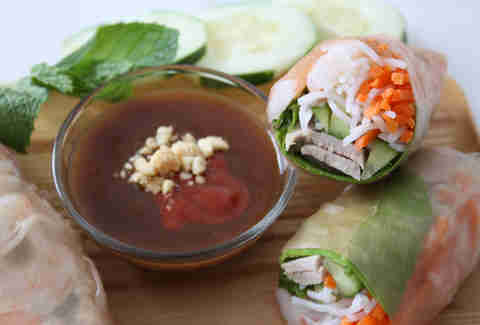 Sometimes referred to as fresh spring rolls, summer rolls, or salad rolls, these unfried rolls consist of vermicelli noodles, steamed pork, boiled shrimp, carrots, lettuce, cucumbers, and mint, wrapped in parchment-thin rice paper. They're served with peanutty hoisin sauce and Sriracha. These Fujian-style fresh rolls are similar to Vietnamese spring rolls in many ways, but the wrapper is more like a crêpe -- made fresh from wheat flour. 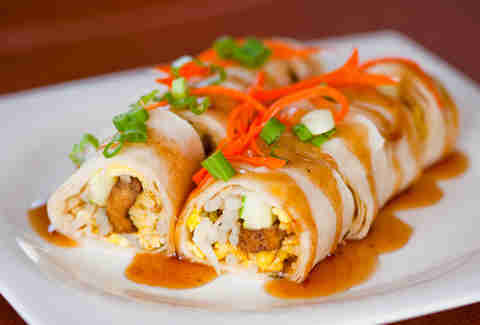 Malaysian popiah are served warm, filled with grated jicama, scrambled eggs, tofu, bean sprouts, and dried shrimp. The sauce varies from black bean to shrimp paste to hoisin. Spicy versions line the inside of the wrapper with chili sauce. Popiah are popular all over Southeast Asia, including Taiwan, Singapore, and Thailand. Fillings can vary slightly, depending on location. Thai popiah are traditionally filled with Chinese sausage, marinated tofu, bean sprouts, scallions, cucumber, and eggs, and topped with tamarind sauce and crab meat. 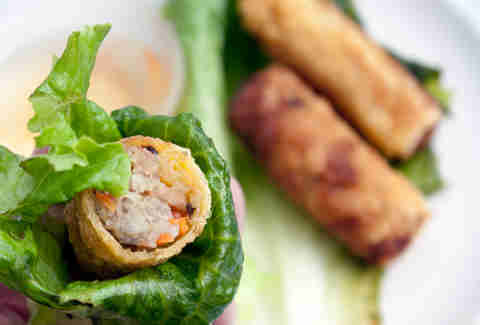 Filipinos have non-fried rolls called lumpia, which are similar to popiah, but bigger (like, burrito size). The filling is stir-fried and consists of pork, vegetables, dried shrimp, and bamboo shoots. These giant egg-crêpe rolls are traditionally served smothered in garlic sauce, but it's also common to see them served with peanut sauce. Got to have that fried garlic on top though. 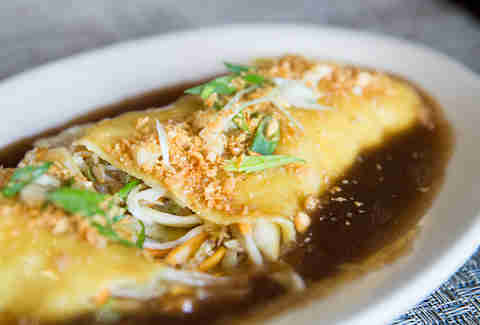 Indonesians make a very similar dish called lumpia basah, which is dry, not saucy.